This 10 sheet set of plans depicts H.M.H.S Britannic in her hospital ship appearance. Actual full size sheets are in 1/144 scale and are 3 ft. wide and 7-10 ft. long depending on the plan. Close-up views of the plan sheets below are not provided. To see examples of the detail, go to the Titanic plan sheets where close-up details of the drawings are shown. 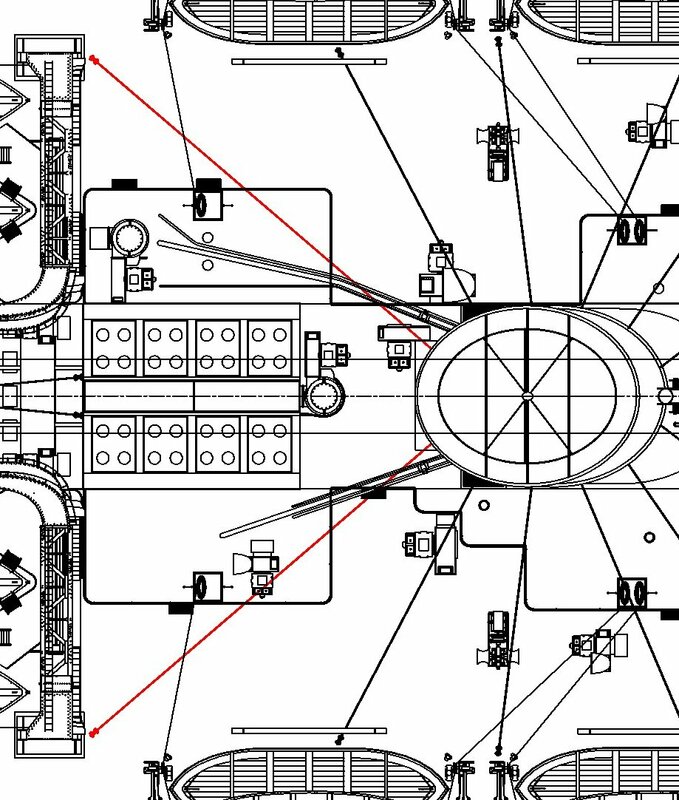 This plan sheet is a drawing of the full port profile of the ship. Frame locations are indicated. Rigging details are shown. Hydraulic riveting on the hull is shown. This plan sheet has drawings of four views of the ship: overhead (plan) view, forward view, aft view, underbody view. This plan sheet has a map of the locations of all the visible ventilators. It also has individual multi-view drawings of each ventilator. This plan sheet has a map of deck equipment. It also includes multi-view drawings of the individual deck equipment items. This plan sheet is a continuation of (Britannic 5a). 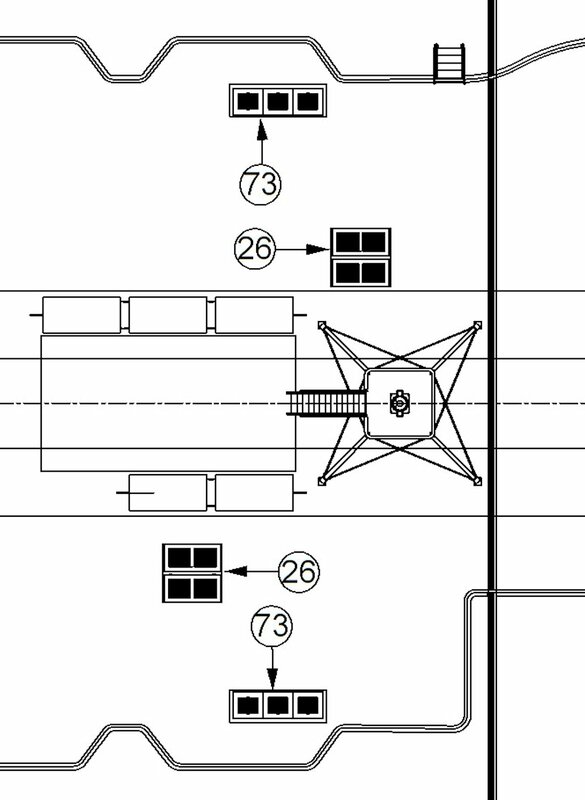 This plan sheet has drawings of the catwalk and boat supports around the gantry davit based lifeboats. 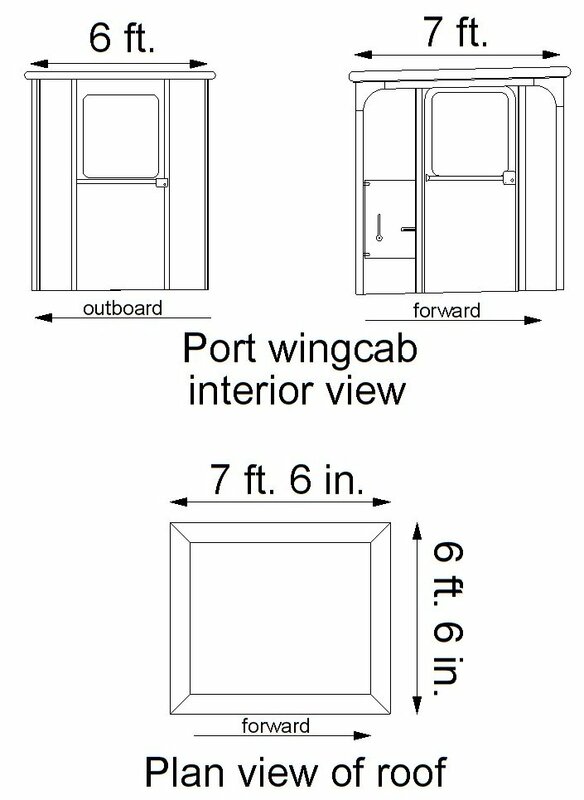 This plan sheet has drawings of the Boat Deck deckhouses showing exterior bulkhead, window, and door locations. 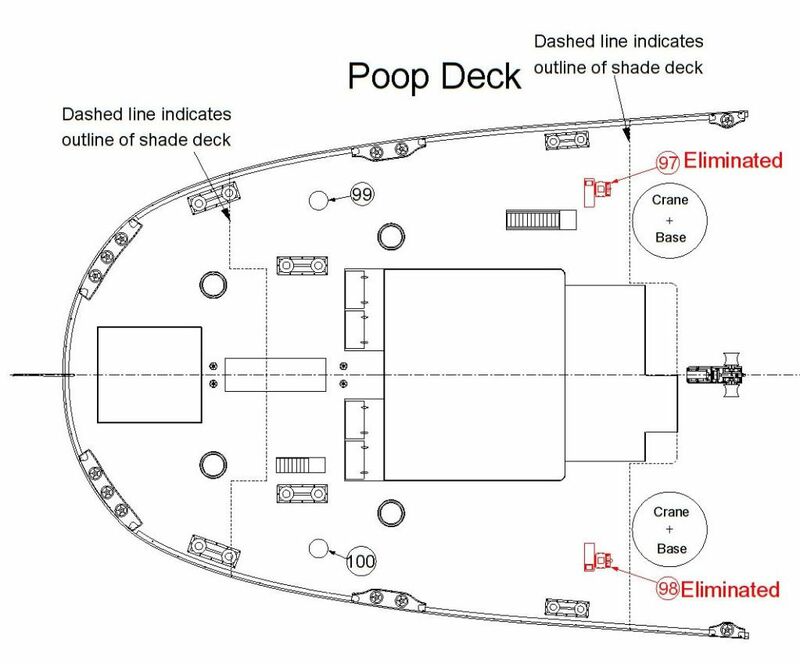 It also has a plan of “A” Deck with the same format as the Boat Deck drawings. 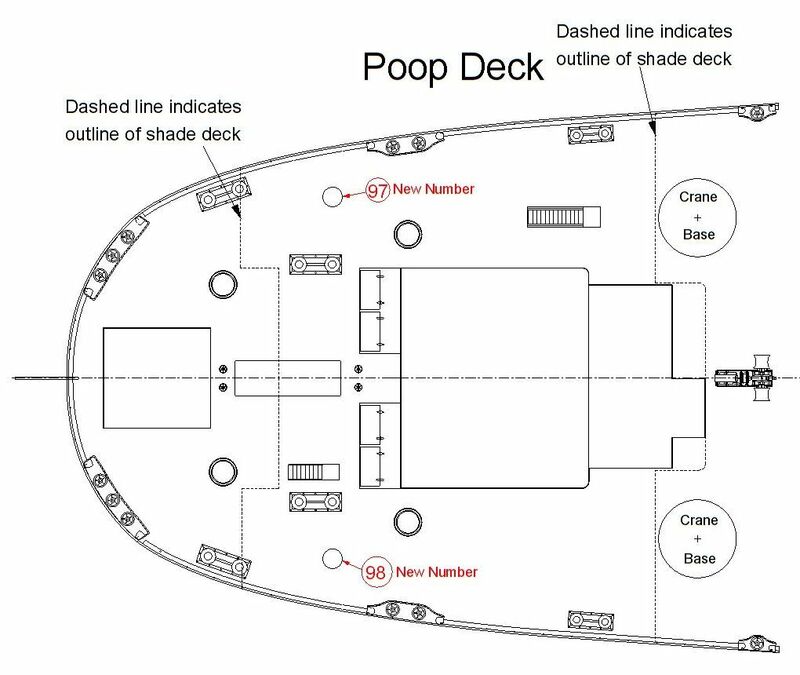 This plan sheet has plans of the “B” Deck deckhouses, showing exterior bulkhead, window, and door locations. It also includes drawings of the forward well deck, aft well deck and docking bridge. This plan sheet has three separate drawings which comprise the hull contour lines. Included are the body plan, sheer plan, and half breadth plan. This plan sheet is a drawing of the shell plate expansion. This drawing has never been found among the Britannic drawings. It was created using the Olympic framing plan and the Olympic shell plating plan. The plan was modified from Olympic to reflect the increased breadth of Britannic. The plan is of constant scale both vertically and horizontally. All hull plates on the starboard side can be visualized in this expansion. This plan will help the modeler in plating the hull. Special Note: It should be noted that the shape of individual plates cannot be derived directly from the shell plating expansion. The shell plating expansion shows the shape of plates in the x and y dimensions. On the ship there is also curvature in the z dimension. The shell plating expansion is at best a general guide to the individual plate shape. The modeler will need to develop the true shape of individual plates directly on the ship. The advantages of this drawing are that it shows all the seams, butts and doubling in one drawing. As an aid to the modeler, notations have been added which show how an individual plate or strake is overlapped or overlaps those adjacent to it. From time to time information comes to light which requires that one or more of the plan sheets be changed. This section will display changes which are more than merely minor drafting errors. All changes will be made to the plan sheets from the date of the change noted here forward. Nature of Change: New photo evidence has come to light necessitating the removal two ventilators. The ventilators were previously numbered 97 and 98. These are the two 20 inch sirocco fans on the port and starboard poop deck promenades. These vents were listed in the RMS Britannic specifications. Previous photo evidence seemed to indicate their location but a better photo which was only recently uncovered indicates that there were no ventilators in these locations. Probably these ventilators were inside the deckhouse somewhere. Below is the photo evidence. 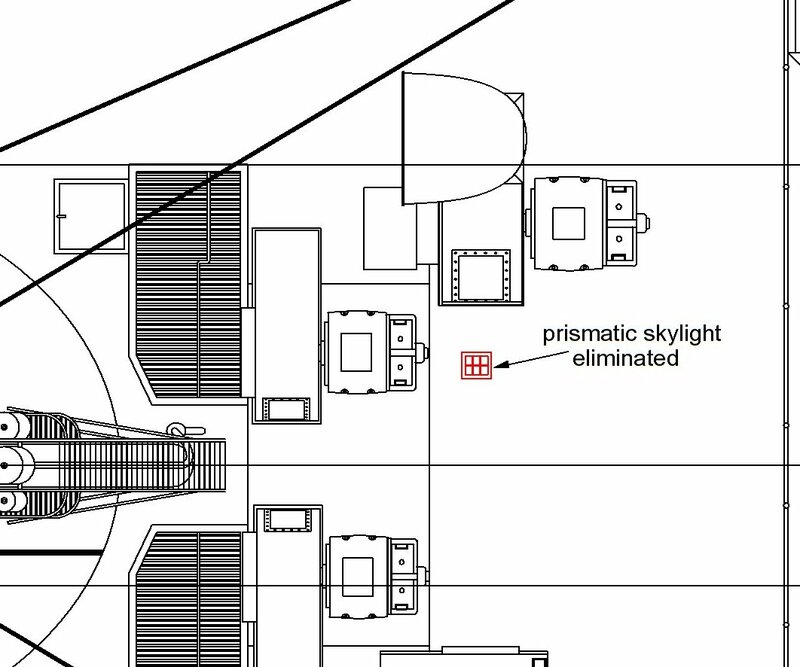 Also there are two images of plan sheet BR4 showing the locations of the eliminated ventilators in red. 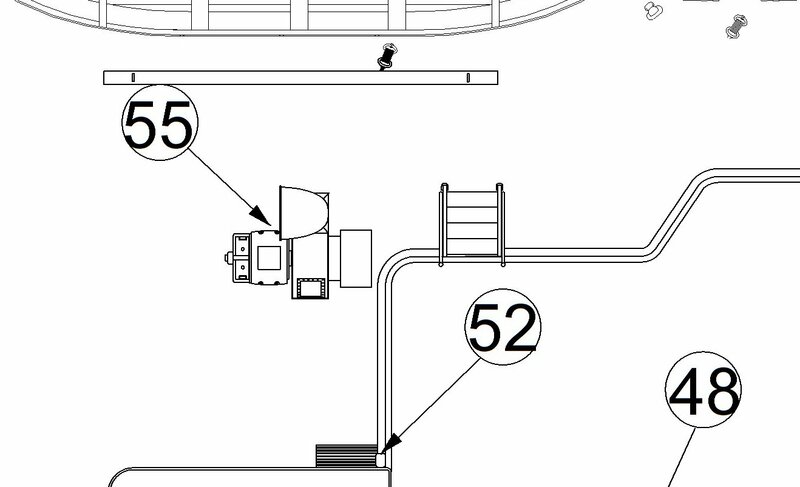 The second plan image shows the alteration of the ventilator numbering. Changes also apply to RMS Britannic. Forward of Funnels 1, 2, and 3 on the port side is an access hatch to the fidley vents. Recent study of archival and wreck photos have led me to alter the size and position of these hatches. 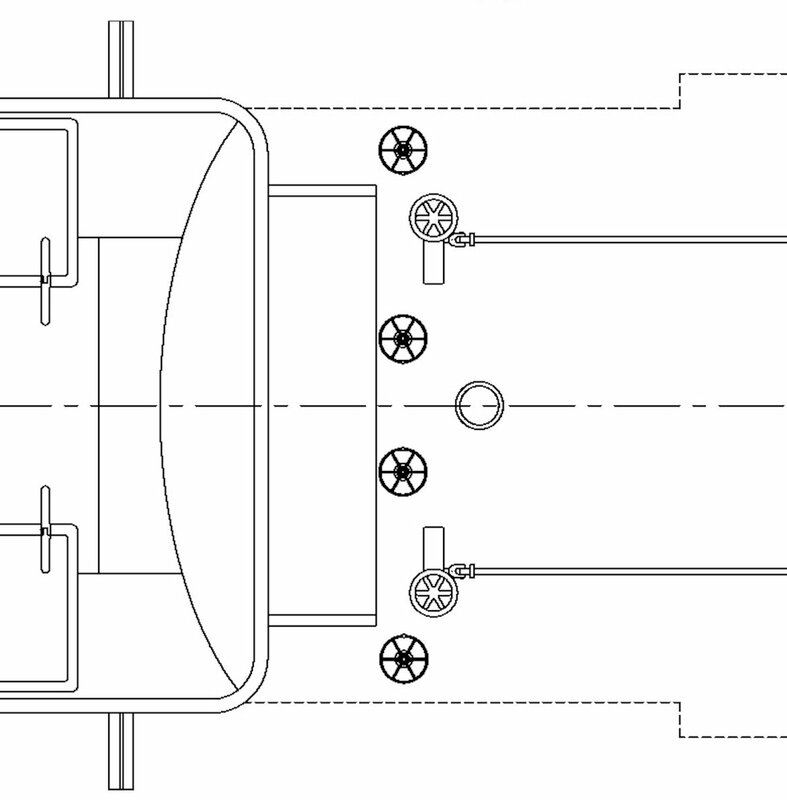 The new positions which are identical for all three boiler casings is shown in the drawing below. Changes also apply to RMS Britannic. Recent evidence has been discovered which may clarify our understanding of Titanic’s wheelhouse. 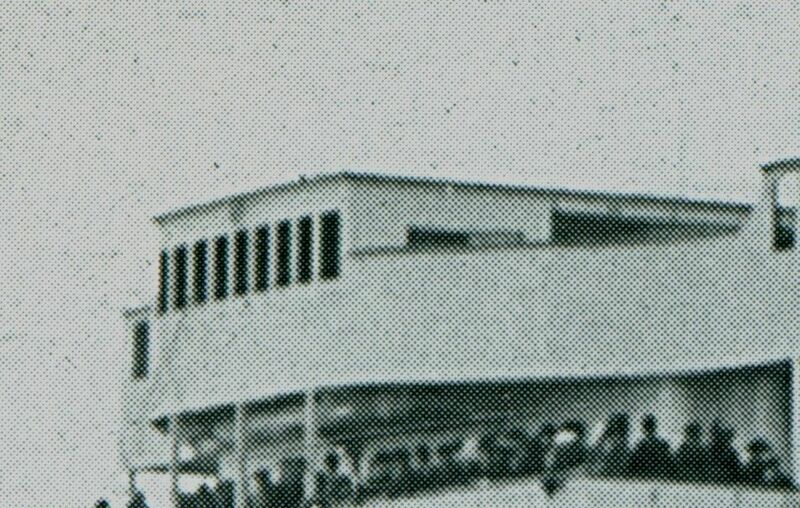 The evidence is a photo of Olympic’s wheelhouse in 1915. This configuration represents changes which were made in Olympic’s 1912/13 refit. These modifications changed Olympic’s officer’s quarters and wheelhouse to a configuration much like Titanic’s. The aforementioned photo is shown below. What we see is that the wheelhouse door is located aft very close to the officers’ quarters forward bulkhead. We also see the incorporation of a circular window in the door which she did not previously have before her refit. 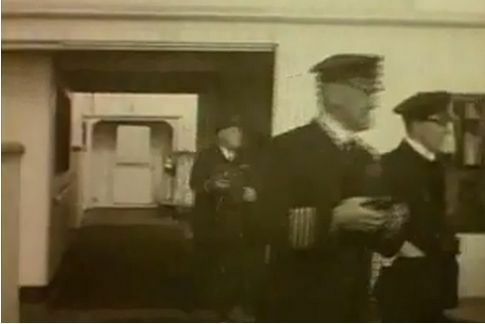 A photo still taken from a 1920’s film of Olympic (below) shows that the side window forward of the door is further aft than originally believed because it isn’t visible in this photo.It appears that the window would be located just forward of where the door would open against the bulkhead. The storm rail could not encroach aft on the bulkhead where the door opened. 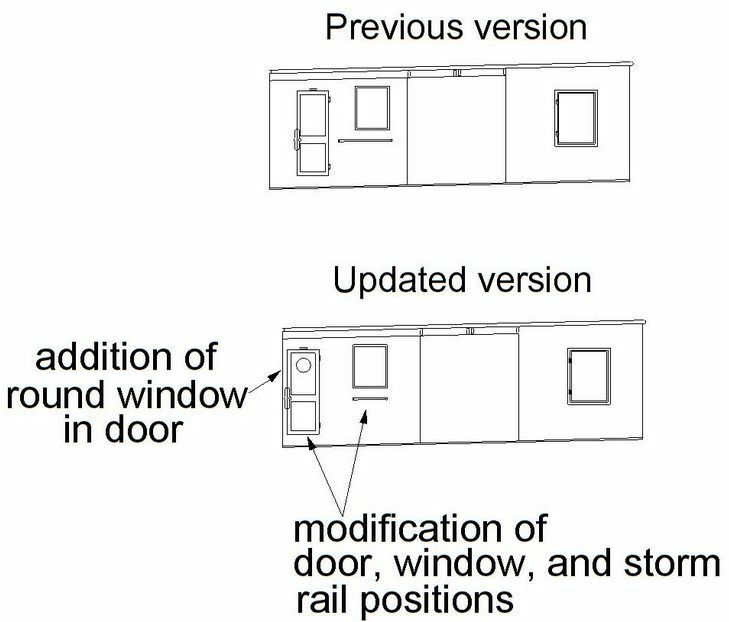 Most likely the forward extent of the rail extends only to the forward extent of the the window since the forward extent of it is not seen in the 1920’s Olympic photo. 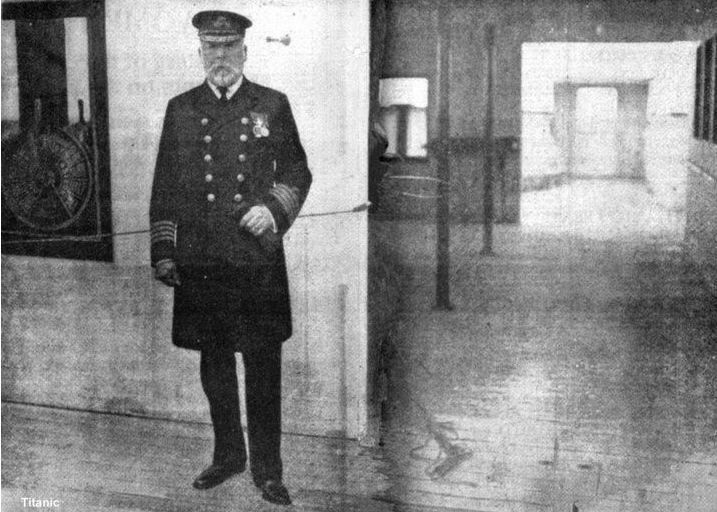 Re-examination of the 1920’s Olympic photo and the only known photo which shows Titanic’s wheelhouse (below) indicates that the forward corners of the wheelhouse were not the large 12 inch radius corners seen in some Olympic deck plans. While the corners aren’t sharp, they appear to have not much more than a 1 inch corner radius. The drawings below show the previous and revised drawings of wheehouse and its associated structures which have been modified by better evidence. It is my opinion that the revised arrangement shown above more closely represents the actual arrangement than the earlier version. Since we don’t, and probably won’t, have an actual photo of the area on Titanic, about the best we can do is make educated extrapolations from Olympic evidence. It is also true that nothing in the new evidence can absolutely rule out other versions of this area for Titanic. But I do believe the recent evidence brings us closer to the truth. 5. Date of Change: 10/27/2012 Note: This change was made during the Titanic CAD plans hiatus period. The date is being given to indicate that plans sold after this date will have this change incorporated. 6. Date of Change: 10/27/2012 Note: this change was made during the Titanic Cad Plans hiatus period. This date is being given to indicate that plans sold after this date will have this change incorporated. Nature of Change: The cowl vent on the port forecastle (Vent #1 on sheet BR4) has been moved one frame interspace aft. This cowl used to be centered between frames 113F and 114F. It is now centered between 112F and 113F. It still retains its perpendicular distance from the breakwater. The drawing below illustrates this minor change. Nature of Change: Recent research has revealed that a change was necessary in the riveting pattern on the funnels. Previously documents had indicated that there were 18 divisions between the rows of rivets. Study of actual photographs have now confirmed that there are only 15 divisions. There is a riveting division on the fore and aft midline on the aft face of the funnels. 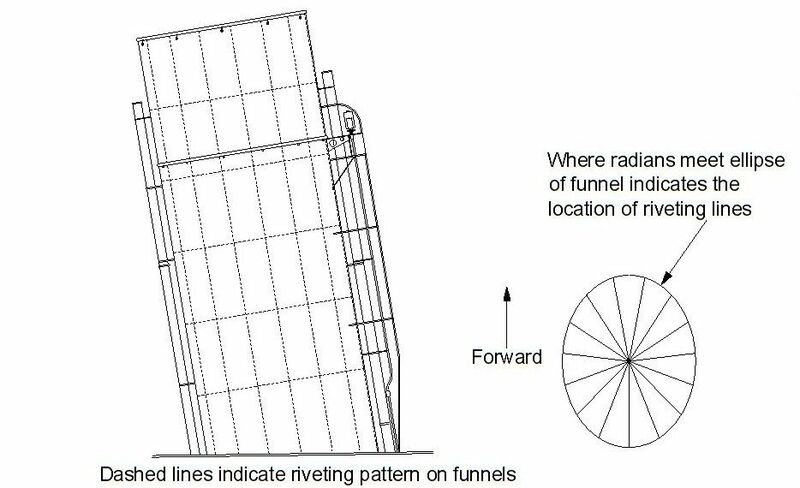 On the fore and aft midline on the forward face of the funnels the riveting divisions are equally spaced on either side of the midline. The image below is the updated drawing which is now shown on plan sheet TI5. Nature of Change: Rather than being a new discovery, this change represents a confirmation of previous information. 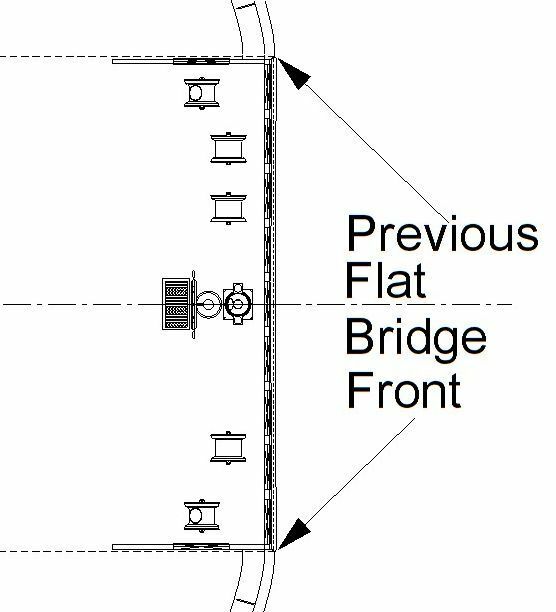 The Olympic Class Boat Deck Iron plan showed the wooden portion of the bridge front with a slight curvature limited to the area of the outboard window on both port and starboard. 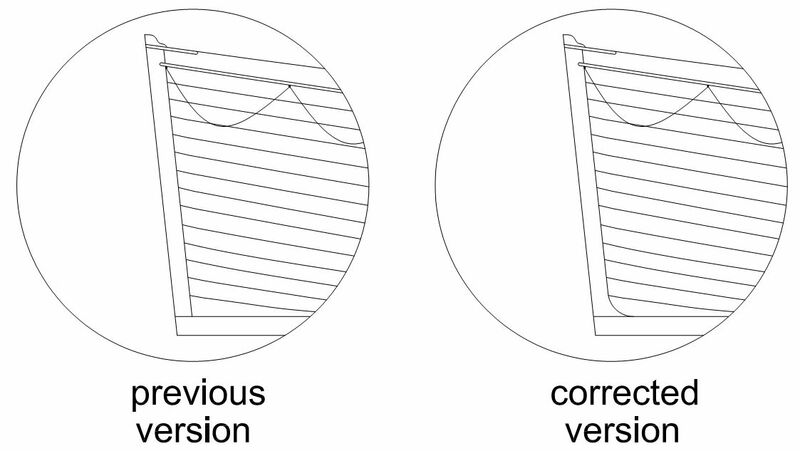 The amount of curvature was noticed on the plan but there were indications on the plan which raised the possibility that it could have been altered in the “as built” version. Photos of the Olympic class ships appeared to show a completely flat wooden bridge front. 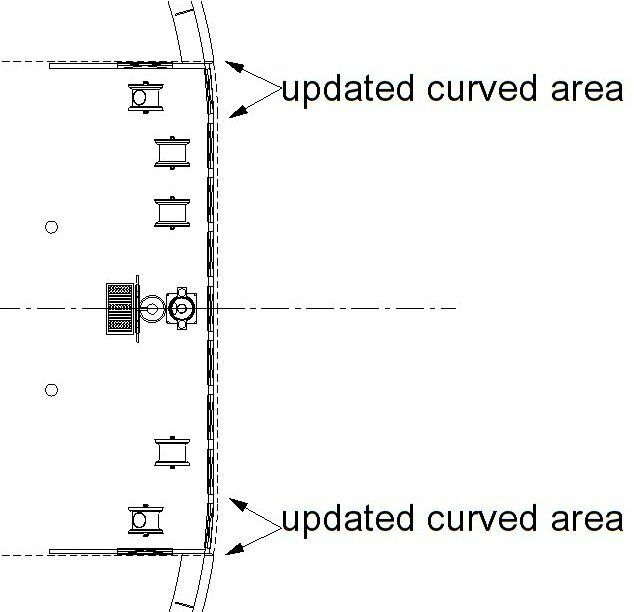 Recently a photo of Titanic was located which finally and definitively confirmed the slight curvature shown in the Boat Deck Iron plan. The photo in question is shown here. Of the nine windows which comprise the bridge front, the inboard seven which are in the flat section are all the same width in the photo. The port side most outboard window is wider than the others whereas the starboard side most outboard window is narrower. This is evidence that these two windows had their outboard edges angled aft. The angle is only approximately five degrees. 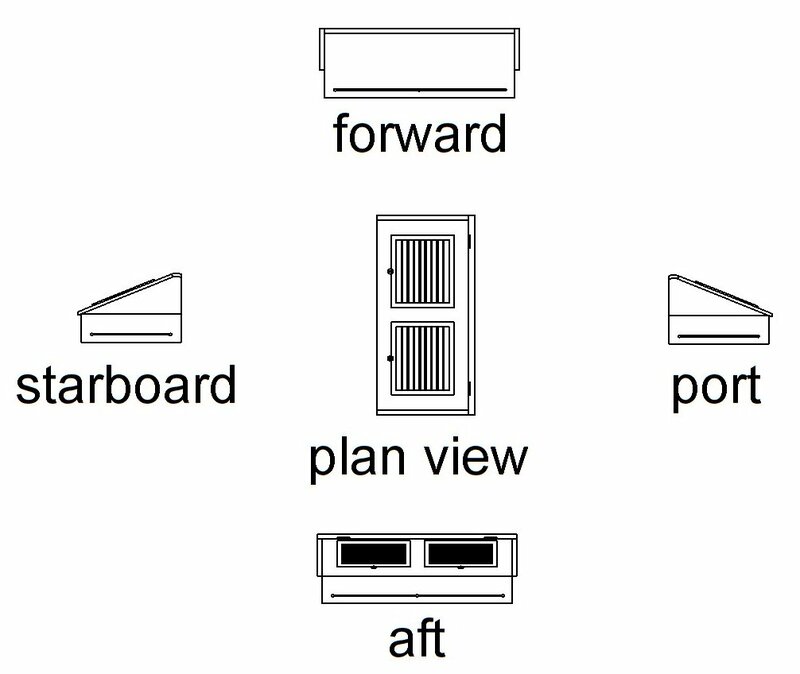 This also means that the aft edge of the most outboard windows is only about three inches aft of the forward edge. To illustrate how minor this change is, the previous plan drawing of this area is shown along with the current plan change. Only the change to plan sheet BR6 is shown because it is the one which shows construction of the bridge area. Nature of Change: Addition of Welin Davit Drawings. When my plans were developed some areas had equipment for which no dimensional references were available. 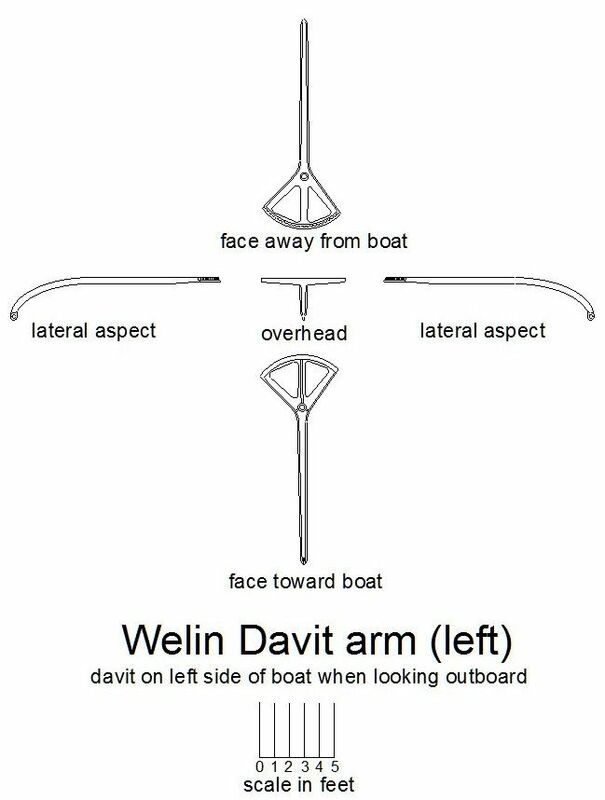 The Welin Davits were in this category. 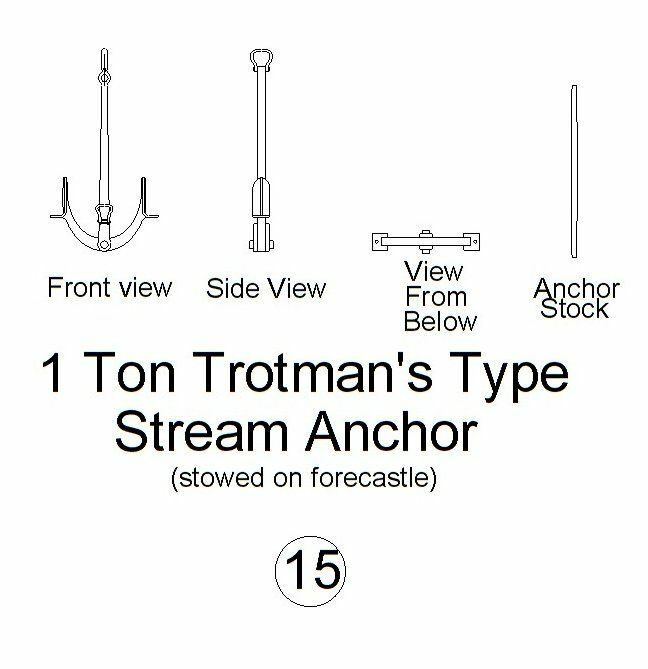 There were patent drawings but I had no confidence that the davits shown in the patent drawings were the models used on Olympic and Titanic or Britannic. Recently I was provided blueprints of the original davits and documentation proving that they were the model used on Olympic, Titanic, and Britannic. Since the original drawings were developed by photo analysis and from the rigging plans, I decided to make new drawings of the davits. The original drawings were fairly close. 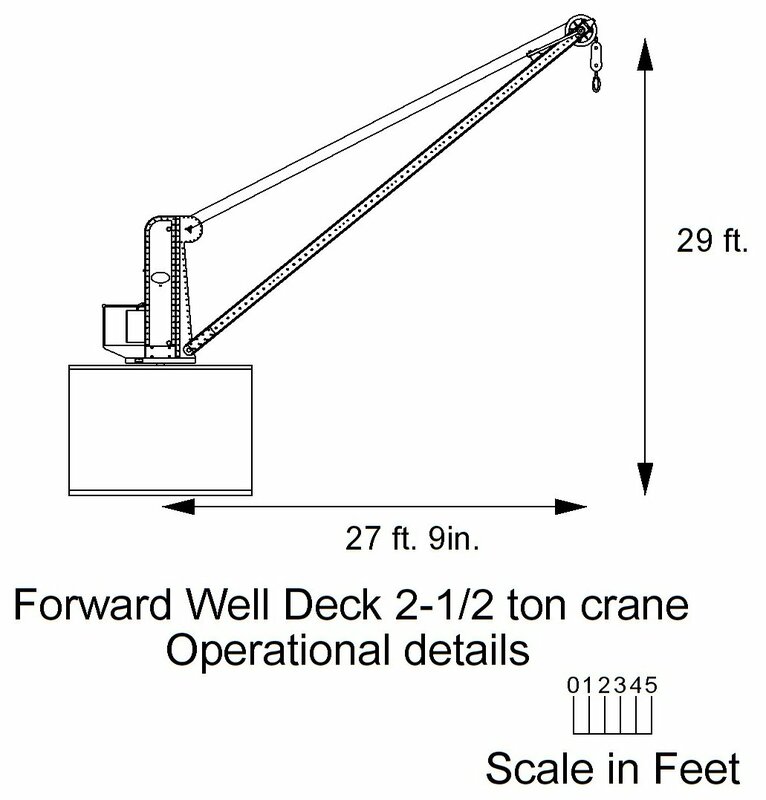 There is about a 10 inch difference in the height (shorter) of the new davit drawings. 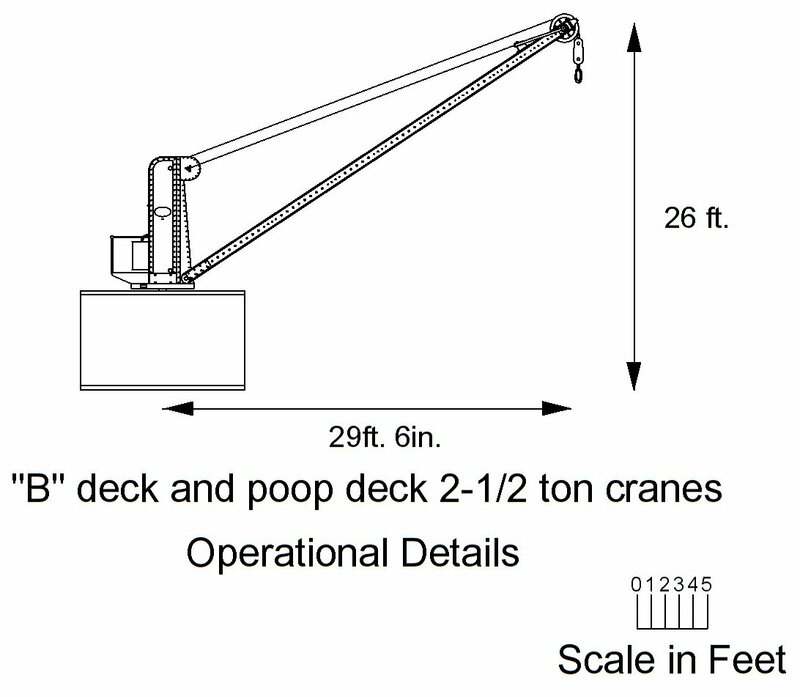 On a 1/144 model this would translate to a davit which is less than 1/16 of an inch shorter. 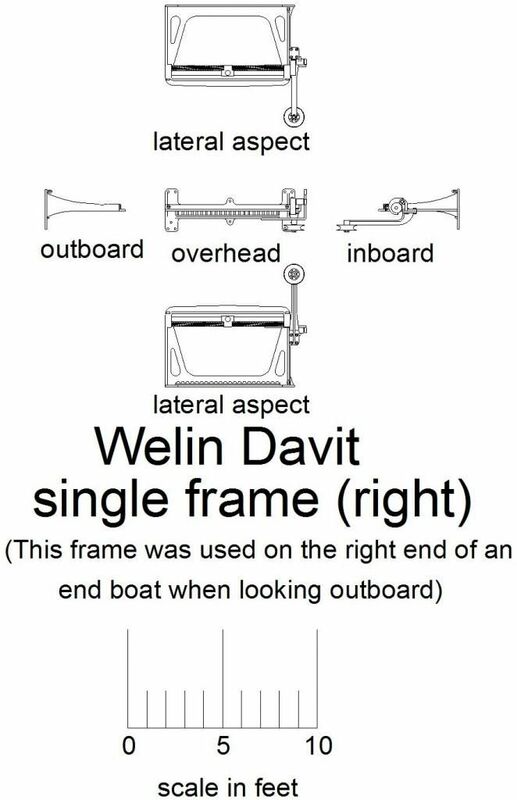 Important note: HMHS Britannic did not use the Welin davit twin frame. They were spaced such that only the single frames were used. RMS Britannic did not use any Welin davits. 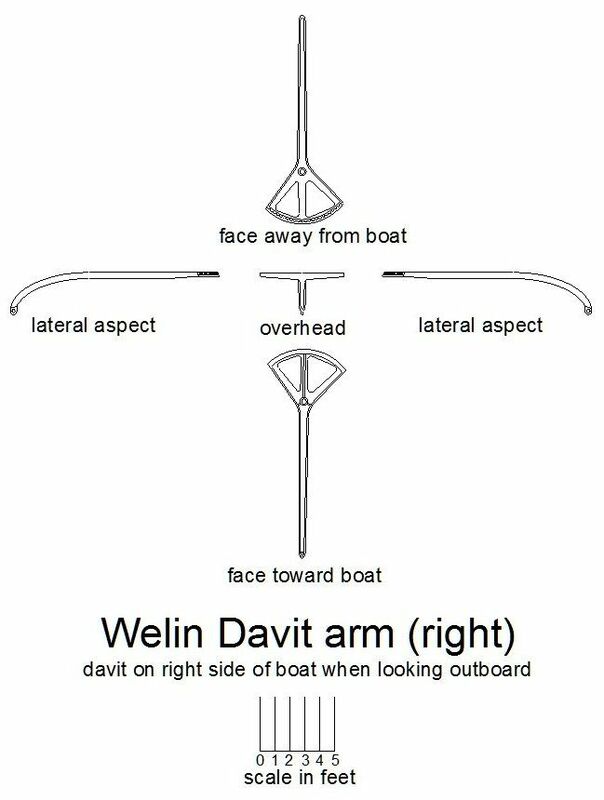 the designations of right and left have to do with the location of the davit arm when looking outboard. Nature of Change: I have found that the lowest planking strake of all lifeboat types nearest the keel (garboard strake) did not have a sharp angle on its aft lower edge where it met the sternpost but rather this edge was rounded. Nature of Change: Recently the Boat Deck Iron Plan of Olympic was re-examined with regard to the dimensions of the wingcabs. The dimensions were found to be 7 ft. in the fore and aft dimension and 6 ft. in the inboard to outboard dimension. The roof overlaps by 3 in. Photos were analyzed and it was found that Britannic’s wingcabs had the same dimensions but were just moved outboard from the positions of the original Olympic wingcabs. The dimensions are shown in the drawing below. It has been discovered that a few plating laps were in the wrong positions on the pages mentioned above. All the modifications of the positions apply both to port and starboard. 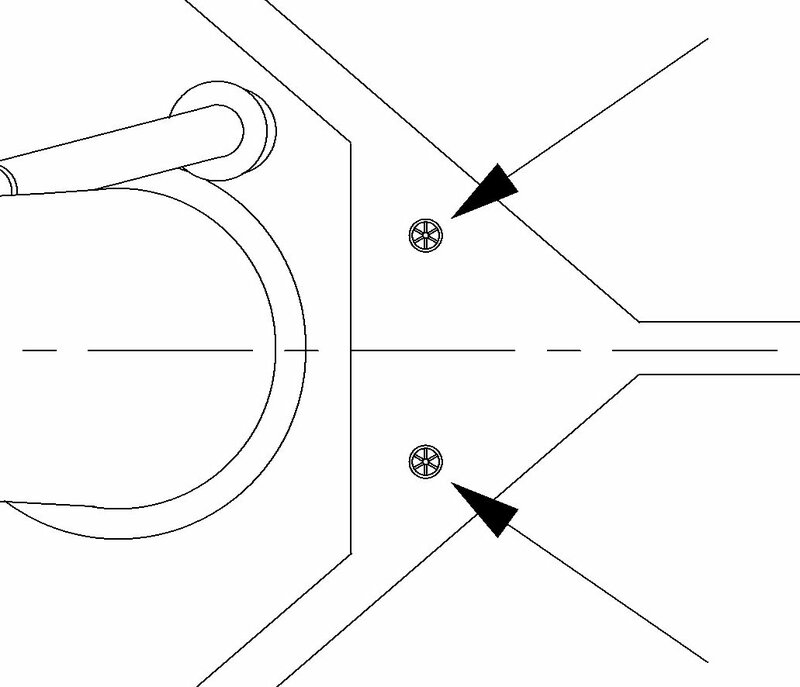 The first drawing shows two plate laps on the drawings which should be eliminated. This is a drawing of Titanic but the plate laps are in the same position on Britannic. 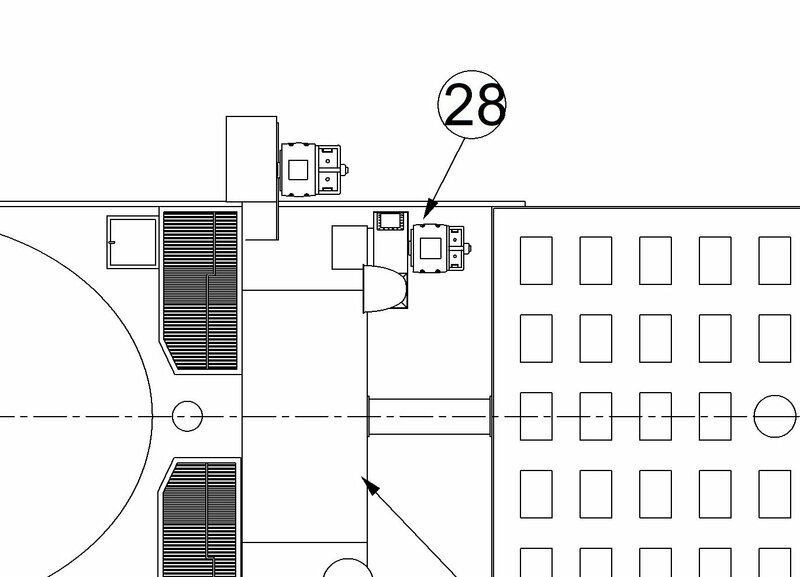 The second drawing shows a plate lap near the aft well deck area which should be shifted aft. This is shown in the drawing below. 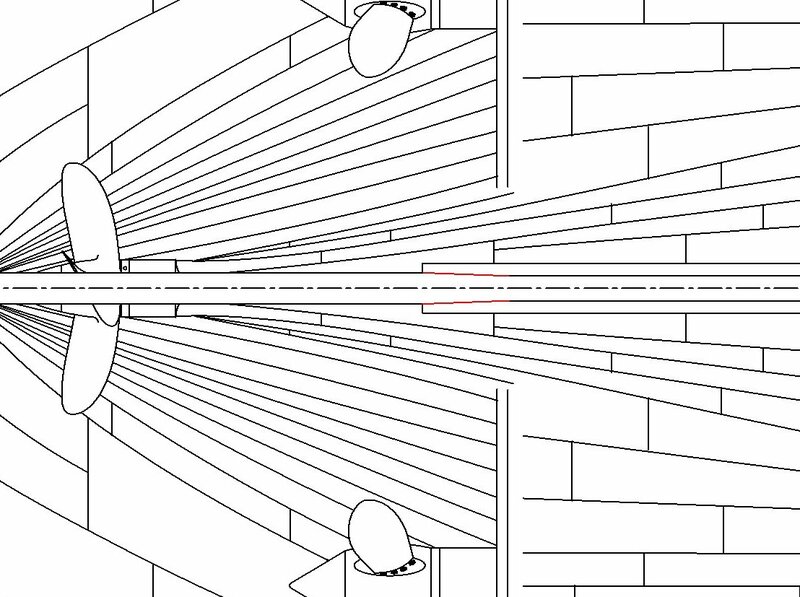 The third drawing shows the positions of four plate laps on the underside of the propeller wings which should be altered. 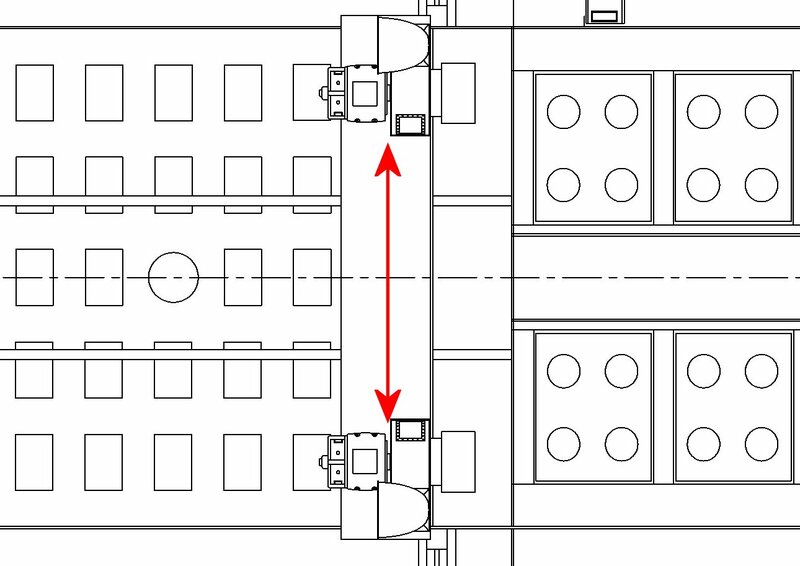 The fourth drawing shows how these plate laps should be altered. 14. This update has been superseded by update #28. 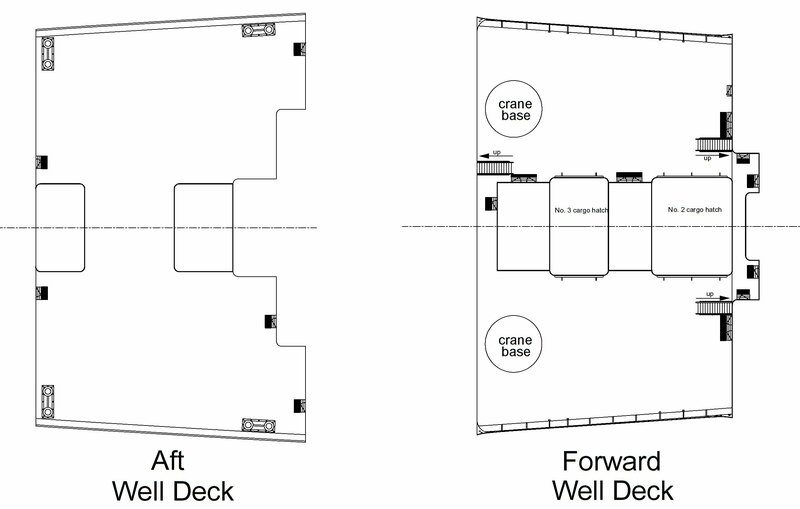 Nature of Change: The forward and aft well deck waterways have been corrected to their proper width of 15 – 1/2 inches. Nature of Change: Recent research has shown that HMHS Britannic’s national ensign was not the standard blue ensign. British hospital ships during WWI flew the “Transport Ensign” which is shown below. 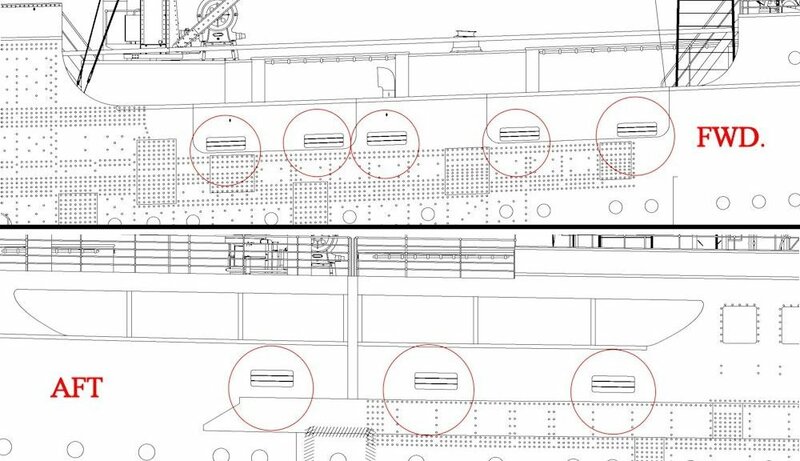 Nature of Change: Photographic analysis has revealed that the wash ports on the forward well deck bulwarks and those on the aft well deck area that was covered both had their wash port doors removed. This left all the wash ports open with protective guard rods over the openings. The drawing below shows the forward and aft wash ports circled with the guard rods in place. 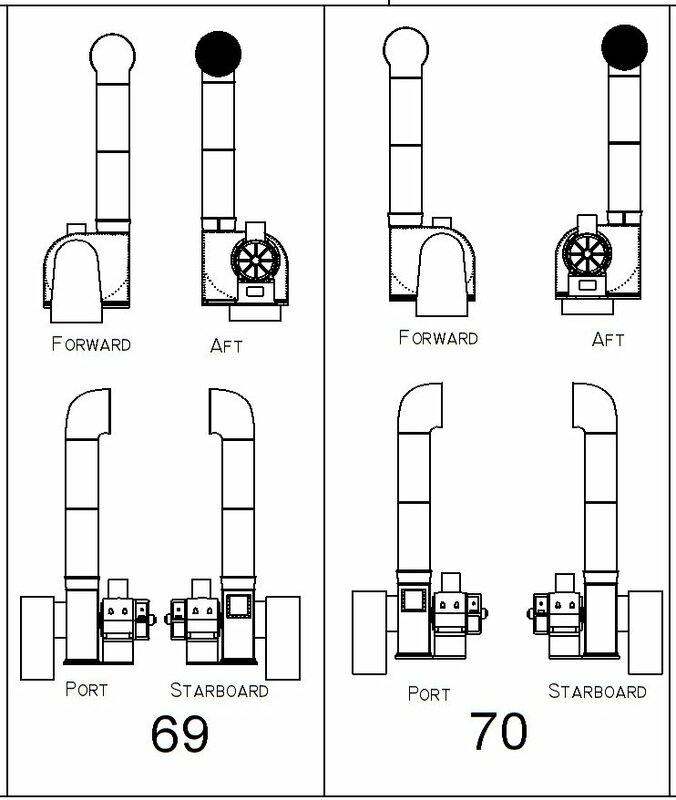 Nature of Change: Due to a discovery of the radii of action of the cargo cranes in “Engineering” journal, the adjustments have been made to the jib elevations of the cargo cranes shown below. Nature of change: Several small changes based on new photos have been added to the steam winch drawings. The bedplate is now “T” shaped rather than rectangular and the interiors of the warping drums have been modified. Nature of Changed: The two valves which controlled steam to the steam winches near the foremast have been moved forward where they are now on top of the shroud over the steam pipes. This change was confirmed by Titanic wreck footage. Closer examination of Titanic wreck images has necessitated a modification of the fidley gratings. The forward gratings have had the inboard angled corner modified. Both the forward and aft gratings have had the athwartship stabilization bar modified in its shape and position. Additional research has revealed that the junctions of the keel plate to the stem and stern were in error on the drawings. The transitions were created without any plate laps or interruptions. 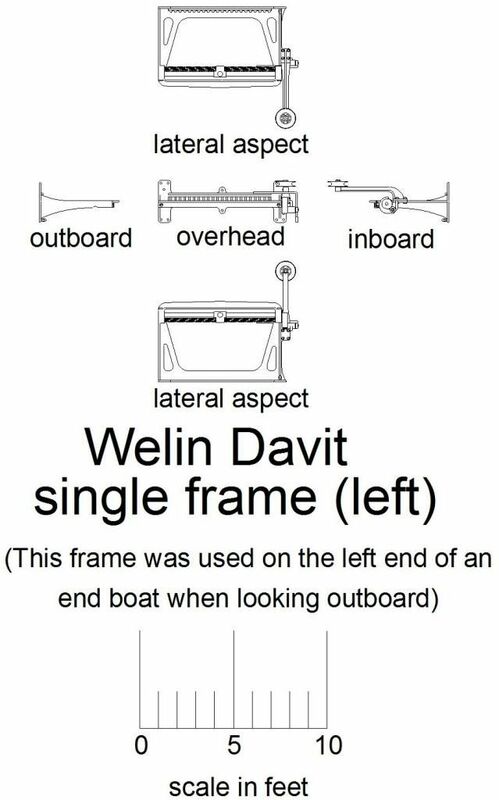 The transition from the keel to the stern frame was accomplished by a tail piece which widened slightly from the width of the keel plate to the stern frame. 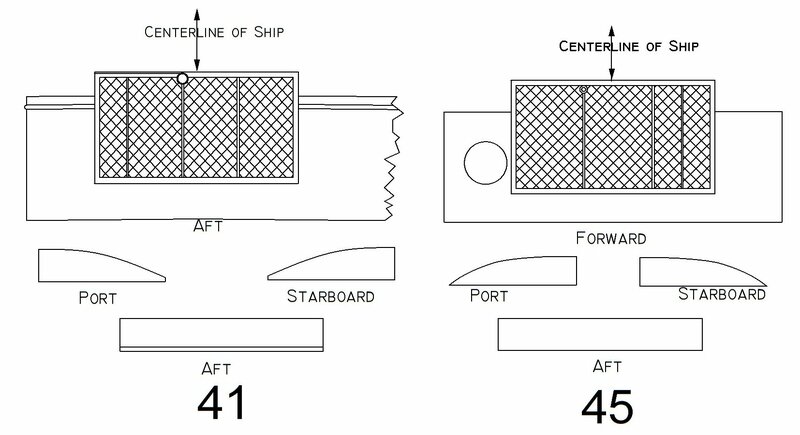 The transition from the keel plate to the stem bar was accomplished by a head piece which narrowed from the width of the keel plate to the width of the stem bar. 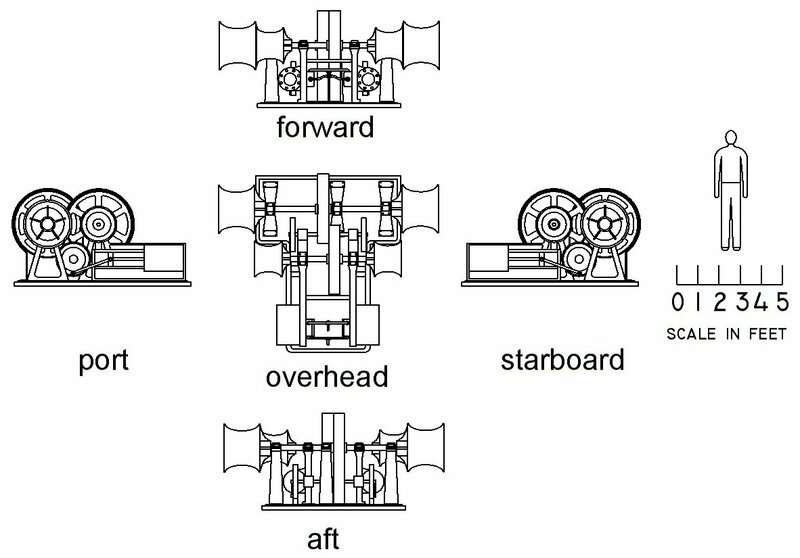 Figure 1 shows the transition at the stern. The red area shows the slight widening where the keel plate meets the stern casting. Figure 2 shows the transition at the stem. The red area shows the narrowing where the keel plate meets the stem bar. Nature of Change: I have discovered that vent #28 in the vent inventory was incorrect. The vent should be mirrored from what it was. In the new version, this 20 in. suction fan has the exhaust cowl duct to the left of the motor when you are looking directly at the motor side of the vent. 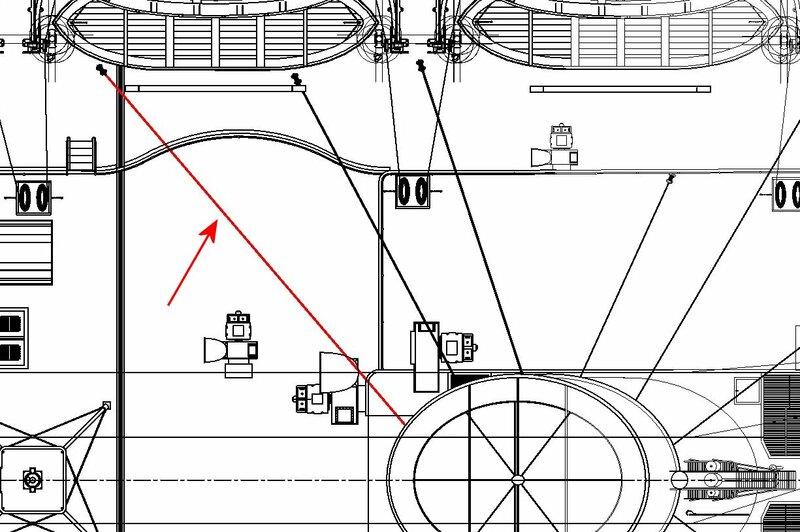 This was confirmed in the Britannic Specification Book because this fan is listed as a “Type E” fan which means that the output duct is to the left of the motor when looking directly at the motor side of the fan. Nature of Change: Recent wreck photos from Britannic have shown that there is no skylight over Britannic’s chartroom. This has been eliminated from the plans. 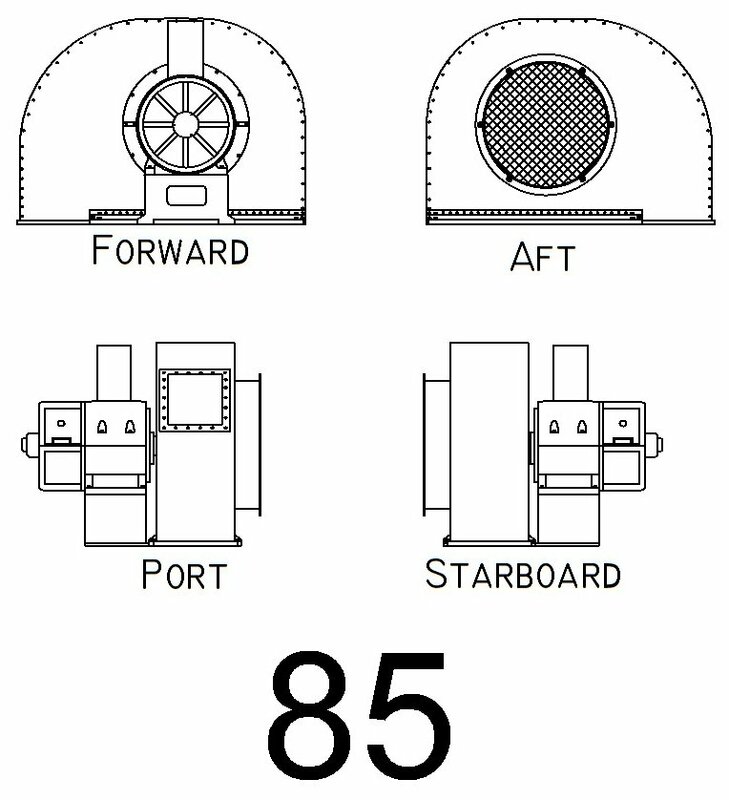 Nature of change: The two 20 in cowled ventilators on the aft end of the tank room (numbered #69 port, #70 starboard) are each mirrored port to starboard. This puts the cowl ducts on the outboard side of the ventilator. Nature of change: The location of vetilator #55 has been changed because of photo evidence. 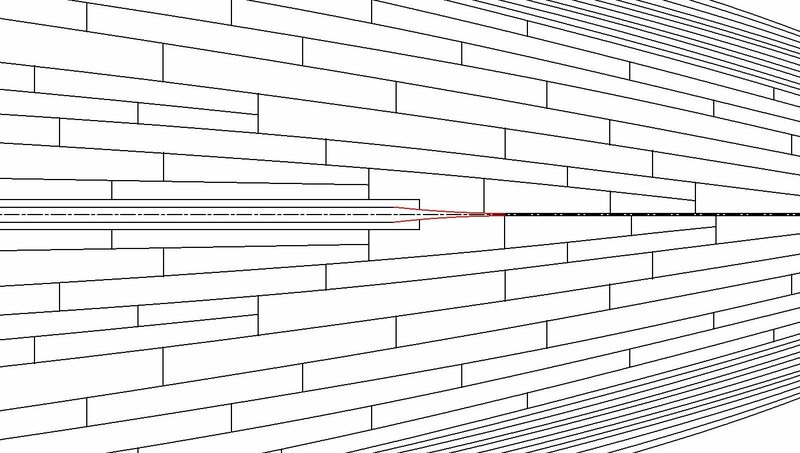 Nature of Change: The position of the port aft funnel shroud of funnel #2 has been modified slightly and is shown in red in the drawing below. Nature of Change: Recent wreck exploration has shown that the skylights over the officers’ lavatory and the Marconi room were changed to a different type on Britannic. The change can be seen in the drawings below. Nature of Change: Recent dives to the Britannic wreck have provided photo evidence which necessitates changes in the Britannic first class lounge skylights. The major change is that it appears that the outboard skylights were roughly 9 ft. long and rectangular. It is speculated that they only had panels which could be raised on the outboard side of the skylights. While evaluating this new evidence, the position of the inboard square skylight was changed after reevaluating the photo evidence. 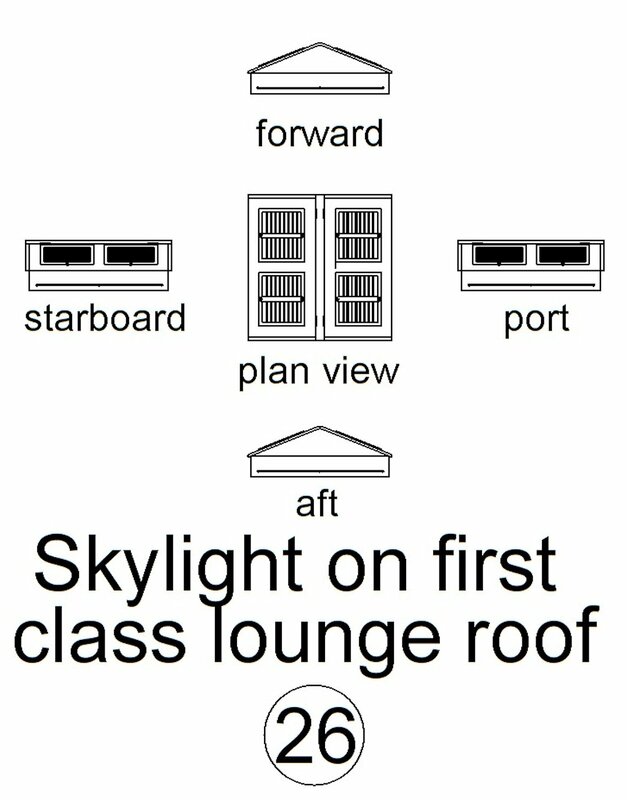 I believe the outboard skylights are not centered over the lounge alcove because it would have to land on frame 4A which is a “cranked” frame. Being “cranked” or curved aft, it was so modified to be able to accommodate the framing of the lounge windows. 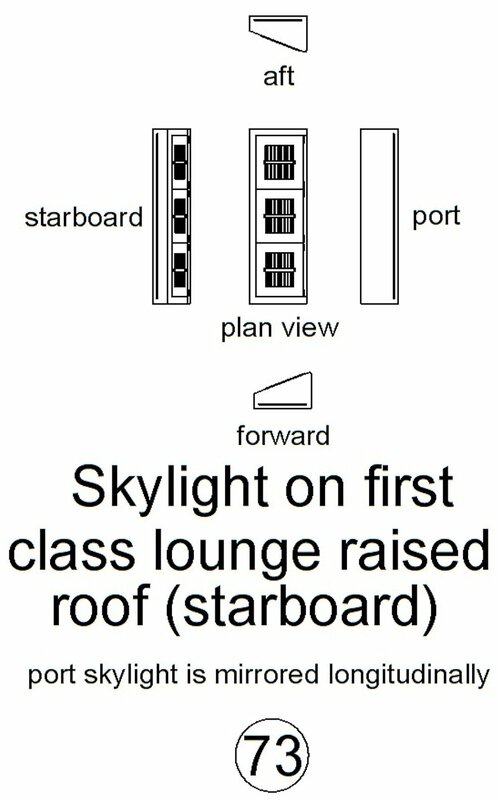 The drawings below show the positions of the lounge skylights and individual drawings of the two types. Nature of Change: This change was also prompted by the recent wreck photos. 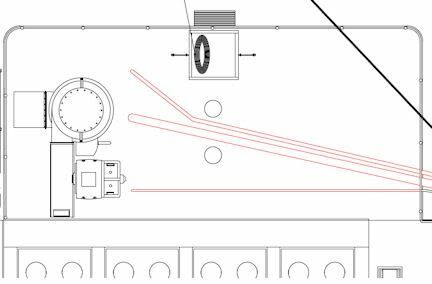 This change involves the change of the positions of the capstan steam control valves and the windlass brake wheels forward of #1 hatch. The updated position is shown below. Nature of Change: Recently discovered photographic evidence indicates that the aftmost pair of funnel shrouds of funnel #3 should be relocated. The new position is shown in the drawing below. 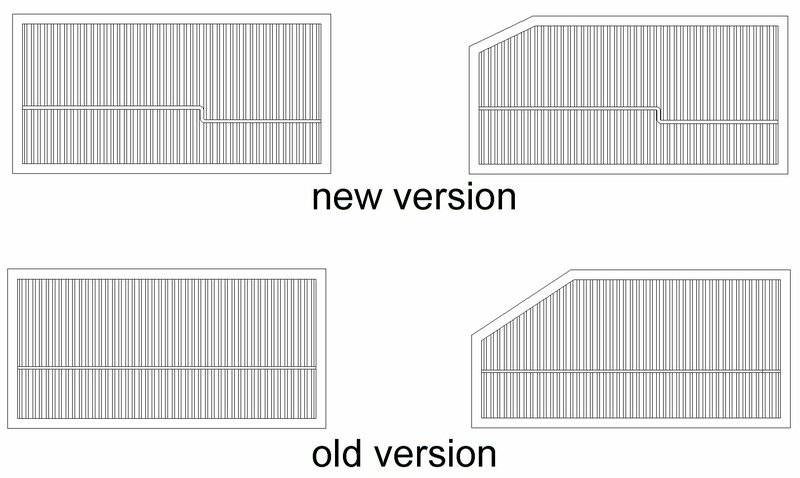 Nature of change: Recent photo evidence shows that the configuration of several ventilators should be modified. Vents accessible to those other than crew which had intakes which were not covered by ducting had intake guards. The ventilators which should be modified are #47,49,61,74,76,85,87. A representative ventilator of this group is shown below. 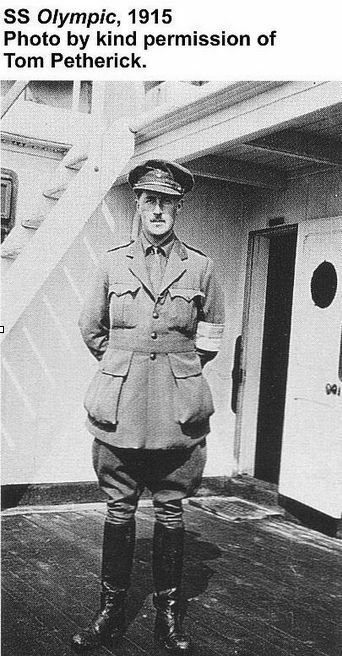 Nature of change: It has been discovered that the forward bulkhead of the officers quarters was wood out to the radius forward corner of the deckhouse. At the deck level of the forward bulkhead of the officers quarters deck house was a 6 inch teak moulding which also included the wheelhouse which was completely constructed of wood. Nature of Change: A mistake was recently discovered in the external configurations of Vents #41 and #45. The external part of these stokehold vents atop the deckhouses covered the entire fore and aft length of the fan trunk. Additionally the part of the vents nearest the fidley trunks were squared off before terminating. The drawings below show the changes. Nature of change: Study of photographs has revealed that the position of the mooring port forward of the D deck shell doors needs to be moved forward 36 in. to the interframe space between frames 47F and 48F. Drawing below shows the change.